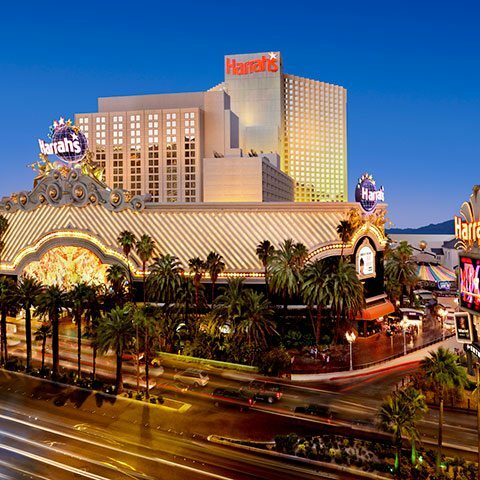 The Dazzling Harrah’s Las Vegas is in the heart of the action on the Las Vegas strip. Now more spectacular than ever with newly remodeled rooms ranging from 600 standard rooms and 72 suites. In true Harrah’s fashion, bold purple fabric and blue sitting chairs playfully stand out against the rooms’ creamy decor, dark wood accents and contemporary fixtures. Seven specialty restaurants, including Toby Keith’s I Love this Bar & Grill. A beautiful tropical pool with private cabanas. A full -service European Spa, shopping and non-stop entertainment. At Harrah’s Las Vegas, the fun lasts all day and all night. Come out and play exciting Las Vegas casino games and progressive slot machines for a chance to win big. You’ll find the friendliest dealers in town when you play one of our 80-plus Las Vegas casino gambling favorites – table games like blackjack, craps or baccarat. From the fast action of craps to the excitement of our new Poker Room, Harrah’s Las Vegas has the most thrilling casino gaming tables on the Strip. Sizzlin’ table games promise non-stop action and fast-paced fun! When you want to come out and play the Las Vegas slots, there’s only one place to start the fun – Harrah’s Las Vegas casino! Our exciting, action-packed casino floor features all your favorite slot games, in formats ranging from traditional three-reel Las Vegas slot machines to video slots where you can play dozens of lines at a time, and in denominations ranging from pennies to $500 a spin. Our slot games feature liberal payouts up to 98 percent and the chance to win a life-changing progressive Las Vegas slot jackpot on games like Megabucks or Wheel of Fortune. We also feature a wide variety of video poker games where you can test your casino gambling skill as well as your luck.